The ALS Mid-Ride Duty Holster (Model 6390) from Safariland provides Level I Retention using their patented Automatic Locking System. The system secures firearms automatically as soon as they're holstered, providing foolproof protection against unauthorized take-aways. Once the release is deactivated, the open-top design allows for a rapid and intuitive straight-up draw. For extra security, the duty holster comes with a Hood Guard and can be fitted with an optional ALS Guard to upgrade it to Level II retention. The SafariLaminate thermal-molded construction makes it highly durable, while its smooth interior protects the weapon's finish. The holster attaches to belts up to 2.25-inches in a comfortable mid-ride position. The holster itself is fine and of pretty decent quality. However, be advised that a Gen 5 Glock 17 with TLR-1 tac light does NOT fit. I had to use a dremel to modify the holster for it to fit. Even then its just too snug to feel confident during a dynamic draw stroke. An M3 tac light fits just fine but youre sacrificing for an inferior light. This is a great holster. It lighter weight and alot better weapon retention then my old roll top. Great holster Looks professional and having the weapon mounted light is a huge advantage. Good holster, just wish the ALS Guard was standard and not an add on. Lovin it. Im running a 1911 w surfire 200, and have no complaints. Once I got the two tensioning screws set to my particular gun, it was a perfect fit. smooth fast draw every time. I took the thumb hood thing off. I don't care for it is all. Only long term concern might be that the kydex may rub on finish in spots. But a duty weapon should be worn and used. Its not a safe queen after all. What a great holster. I much prefer the ALS only to the SLS with ALS. This may just be my personal preference. I have used Safariland SLS, ALS, Raptor, Blackhawk lvl 3 SERPA with and with out light and this is my favorite. The only time I might recommend not using this is if you are working in a very crowded area. Great holster, very secure and very fast draw. After some use on duty, it has held well. I recomended this holster to a friend and he likes the holster as well. You won't be disappointed with the purchase. Cops Plus had great delivery time. Safariland makes great equipment. This holster is awesome. Works great with my light and properly fits. For the optional ALS Guard, how do you order that?? Please do a search for Safariland ALS Guard - Model 6006, part no. is 6006-1-21. 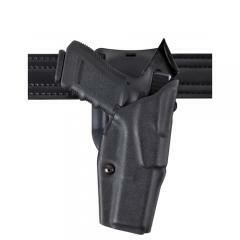 The 6390 holster for the Glock 35 - would like the optional ALS guard. How do you include that in the order? The product is called "Safariland ALS Guard - Model 6006" and is available on our website by searching '6006'.